HomeGOVERNMENTWill the US-Created ISIS Attack Americans on US Soil? Those of us in alternative news media shoulder a growing responsibility of shedding light on the truth where little to none exists anymore either in government and mainstream media. As such, citizens of the world but especially of America need to know that the so called Islamic State of Iraq and Syria (ISIS) like al Qaeda before them are the created, well-paid, well-armed secret mercenary ally of the US Empire in cahoots with Israel, other Western nations, NATO, and US Muslim allies Saudi Arabia, Turkey and other oil-rich Gulf state puppets. The Intelligence Committee Chairman in Congress must know that these ISIS fighters as US mercenary allied boots on the ground in Syria, Iraq, Libya, Yemen and spreading globally are extremely well financed, trained and armed by his own US coffers. Meanwhile, Army Colonel Kenneth King, a US detention camp commander in Iraq, reminded the Daily Beast last year that when the current ISIS leader Abu Bakr al-Baghdadi was let out of his prison in 2009, he promised, “I’ll see you guys in New York.” According to Edward Snowden documents, to top it all off, Baghdadi is reputedly a born and bred Israeli citizen and Mossad agent named Elliot Shimon. ISIS’ overt promises to attack Americans on US soil has been reverberated repeatedly by neocon warnings that Islamic State is waging a global war invading and perpetrating jihadist terrorism worldwide. Not by accident, the one nation that seems most immune from any Islamic State violence thus far is none other than Israel. Perhaps Netanyahu’s trips to his Golan Heights hospital cheering up his wounded jihadi terrorists are paying off. Last October Breitbart news posted an FBI internal document warning of homegrown violent extremists (HVE) and radicalized ISIS sympathizers carrying out attacks against law enforcement and government personnel within the US. This FBI bulletin came in response to ISIS social network messages posted by none other than big daddy Baghdadi himself instructing jihadists and domestic wannabes to kill cops and soldiers in both America and abroad. Obama and his fascist regime have long recognized that more Americans are growing angrier each year at the gross two-tiered injustice system (one for the privileged elite and the other for the rest of us), the pervasive police state killing of its own citizens (especially African Americans), and the fact that this increasingly armed and dangerous world of global tyranny has only deceptively made us all far less safe. The growing impoverishment resulting from the bankrupt global house of cards debtor system economy on the verge of total collapse has only accelerated the globalists’ doomsday endgame scenario. After every staged fake ISIS beheading, out come the parade of former CIA propagandists and neocon shills on all the MSM newscasts pontificating how ISIS cells are already operating and multiplying throughout the United States. After all, this charade game’s been going on now long enough that waves of American and Canadian jihadists fresh from the Iraqi and Syrian battlefronts are coming home to plot terror on North American turf. Or the CIA dis-informers will reassure Americans that more of those staged beheadings are on the way in reaction to recent US air strikes that never seem to make any real dent in reducing Islamic State’s ever-growing numbers. Or are they talking about all the US bombs killing off innocent civilians in Iraq and Syria. Obama’s now bombing Assad’s troops, manipulating what he was determined to do two years ago when the world stopped him as Putin brokered the last minute deal to get Assad to turn in his cache of chemical weapons (despite Obama-backed rebels being guilty of the attack on the Damascus suburb). Obama’s real agenda all along has been to go after Assad, not ISIS. Under the pretense of “rooting out ISIS,” the US and Israeli bombs have attacked Syria’s energy infrastructure by destroying oil refineries and grain storage silos. Anything but wiping out ISIS… kind of like the so called “misplaced” airdrops of vital food, medical and arms supplies that are supposed to be going to the only real fighting force that has half a chance of defeating ISIS, the Kurds in Iraq. But somehow (accidentally on purpose) who seems to invariably wind up with all those supplies? Of course, Empire’s closet ally ISIS, who else? Bottom line, if US Empire possessed the political will, the most potent killing machine on earth could eliminate ISIS in two or three week tops. But the Empire’s forever war on terror would have to end if ISIS suddenly ceased to exist. Dozens of those pundits from neocon think tanks and prior administrations have been sounding the MSM alarm promoting the idea that a coalition partnership-in-crime has already been forged between the various drug cartels, the MS13 gang and the Islamic State. They also recirculate the belief that Osama bin Laden delivered nuclear technology to al Qaeda operatives here in the US by way of suitcase nukes and they could easily be in Islamic State’s possession now. In actuality, it’s far more likely that the only suitcase nukes strategically planted in various US cities are part of Israel and Mossad’s Sampson Option, global blackmail to the world powers in order to ensure that Israel never gets attacked by any other powerful nation or Israel will nuke the whole lot of us. Nonetheless, no doubt there are evil enough nuke or biological/chemical warfare peddlers out there willing to sell WMD’s for the right price to the likes of ISIS. And based on the money flowing into Islamic State hands from a number of sources like the US, the Saudis and other wealthy Gulf states along with the IS revenue generated from the black market sales of pirated oil and drugs, anything is possible. 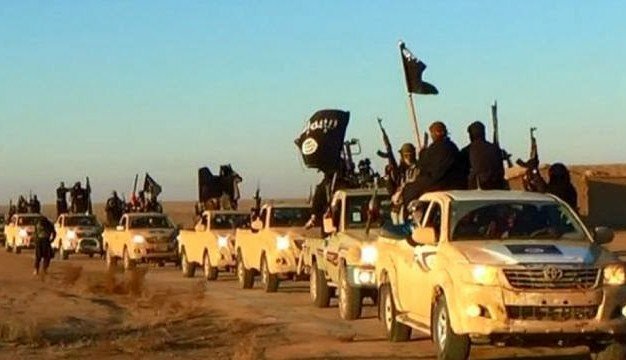 Speaking of nuclear material, a month ago Mexican officials had to admit for the third time in less than a year that a truck containing deadly radioactive Iridium-192 was stolen from an area controlled by a drug cartel, the same one training with ISIS. Though in this latest case the material was later recovered, previously missing nuclear substances and even missing nuclear warheads remain unaccounted for. Because a pattern of lost nukes over time persists, it seems inevitable that at some point one or more fall into the wrong hands, particularly when ISIS hands are so well-funded. To provide a full backdrop for what’s to come, a brief overview of President Obama’s foreign policy in Latin America will offer insight and understanding of the precarious stage currently being set. Obama’s record south of the border follows suit with his foreign policy everywhere – disastrous except for the globalists pulling his strings. Hilary’s State Department and CIA induced regime change coup ousted the Honduran president in 2009 followed by several more coup attempts that failed to overthrow Venezuelan President Nicolas Maduro (recall Bush’s multiple failures at ousting Maduro’s defiant predecessor Hugo Chavez who rightly called Bush “the devil”). Obama policies have empowered criminal gangs such as the MS13 along with the all-powerful Latin American drug cartels to rule much of the Southern Hemisphere with absolute impunity, rampantly inflicting increasing lawless violence on both sides of the US border. Obama has been financing weak, corrupt puppet governments in Central America and Mexico owned and controlled by the drug cartels, enabling both the cartels as well as the United States government to continue bilking enormously obscene profit obtained illegally from the international drug trade boosted also by bumper crop yields of opium and heroin smuggled in from Afghanistan. Obama is complicit in causing the crime and murder rates in Central American nations to soar among the highest in the entire world. As an example, Honduras’ murder rate is the highest in the world. In El Salvador the lawlessness and lethal dangers facing citizens struggling to work their jobs every day is now so out of control that their feeble government cannot even protect them. The crime cabal gangs and cartels blatantly responsible for the skyrocketing violence are demanding that their extortion fees be codified into law by the national government. In the meantime, El Salvador’s murder rate is up by 50% over last year and with the work force unsafe to leave their homes, the nation’s economy seems in its final death throes. With gang turf wars raging, June saw El Salvador’s highest homicide rate since the civil war nearly a quarter century ago. The globalists have heavily invested military application of artificial intelligence (AI) technology for not only ultra-invasive surveillance but tactical military purposes on the battlefield as well. Enter Jade Helm as the beta tester for its PSYOPS and Jade Helm 2 AI software. Artificial intelligence through automated mechanization on the modern battlefield will take the human error out of war-making murder and mayhem and efficiently eliminate any human opposition attempting the now obsolete guerilla warfare. The ruling elite has harnessed incredible advances in electronic and weapons technology to exponentially increase its absolute power and control over the global population. The feds’ deployment of human personnel like ISIS is currently being augmented by AI and very soon human soldiers will largely be replaced by armies of militarized killing robots. The most egregious, most horrific science fiction scenarios are already developed and ready for deployment today in the here and now. The Manchurian candidate president has dutifully carried out his treasonous role as a globalist puppet to systematically undermine and destroy the United States. His fast tracked Trans Pacific Partnership despite a recent snag acts as the ultra-secret blueprint weapon for one world government to take form. Absolute global tyranny under the elite’s New World Order has been rapidly unfolding through disturbing events and developments virtually all year long. With Jade Helm scheduled to end next month and likely going live in response to the staging of yet more created false flag crises, accompanied by Pope Francis’ history-making address before a joint session of Congress on September 24th and the United Nations on the 25th, it appears that the stage has long been set for the fall of America timed with the New World Order’s official launch. The globalists will be in victory celebration in their mansions. Hope and pray for the best, be prepared for the worst.